My husband is doing the Master Cleanse and it’s making me hungry. For those of you who don’t know Paul, his philosophy might be summed up as something like “Life is the stuff you do to pass the time between meals.” He likes to eat meals, preferably at a restaurant. He likes to plan where he will eat his next meal, the one after that, and maybe a special one sometime next week. He likes to look forward to his plans to eat meals. For those of you who don’t know the Master Cleanse, it is a dietary program consisting of NO MEALS. Unless you consider water mixed with lemon juice (cleansing part), sweetened with a tablespoon of maple syrup (to keep your blood sugar up so you don’t faint), and a dash of cayenne pepper (to stimulate your metabolism) to be a meal. Paul’s intention is to do this for ten days. Fasts are an age old tradition, so I’m sure he will be fine. Normally, I like to consider Paul to be the one with “food issues.” Because of, well–all the eating, and planning, and the way any time you get in a car with him, you run an 85% risk of being “Paul-jacked” and taken to some kind of food or dessert purveyor. I consider myself to be the person with a healthy relationship to food, because I sometimes eat vegetables, or take my lunch to work, or make frozen ravioli and broccoli at home instead of driving to to the Inland Empire in search of the only local branch of a chain restaurant that makes the kind of mac n’ cheese that I’m in the mood for. Long story short, when it comes to food, I’m reasonable–he’s crazy. I’m moderate–he’s extreme. Except now that he’s not eating, something is happening to me. I think it might be like a sympathy pregnancy–except it’s sympathy starvation. All the sudden I’m hungry all the time. I’m constantly ruminating about what kind of food I’ll eat next. And when I start eating, I keep eating, because the idea of being hungry again is panic-inducing. 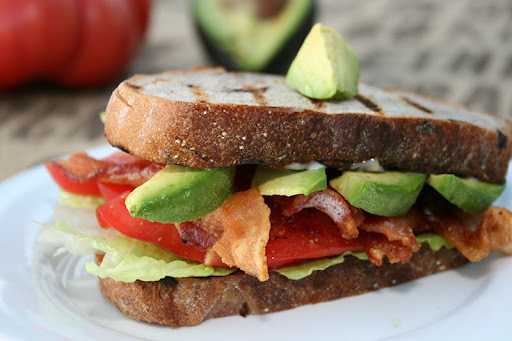 Since I’ve begun writing this post, I’ve eaten two halves of a particular sandwich–a large bacon, lettuce, tomato and avocado sandwich with garlic aioli on oversize toasted sourdough bread. The last time I ordered this sandwich, the shop that sells it was still on summer hours. The last time I ordered this sandwich I ate half for lunch, and the other half for dinner. But today I thought about the sandwich non-stop for five hours at work, while staving off hunger by eating a candy bar from a vending machine! And then I ate both halves in under twenty minutes. And now, despite the whole earlier candy-from-a-vending-machine debaucle, I’m wondering if I need dessert. Do I need ice cream? Do I need a snack to get me through class? And what about when class is over? It is typical for me to be hungry when I get out of my night class at 9:30, but I don’t worry because I have an unofficial arrangement where Paul picks me up something wherever he happens to dine. Now, however, Paul won’t be dining. Alarm Bells! I am already mentally searching the shelves of the refrigerator for something quick and easy to prepare–in my imagination (and likely reality) they are frighteningly bare. Oh no! I’m so hungry! No, wait, you’re not hungry. You just had a huge sandwich. Oh. Right. … But I’m going to be hungry! I’m going to be happier when Paul is done with the Master Cleanse. Previous Previous post: 3 Weeks?